In late 2016 Quadriga were awarded the ‘Heritage Package’ at Hanover Building, Manchester. Construction of the building started in 1905 and was officially opened in 1907. Hanover Building reflects the Edwardian baroque architecture of the time. The building became Grade II listed in 1988 and is part of the NOMA area of the city centre. As part of the package Quadriga have undertaken a range of works. 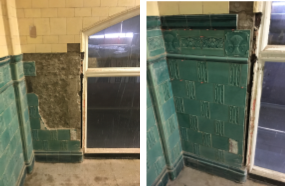 Many of the Edwardian tiles at Hanover Building were missing, damaged or broken. 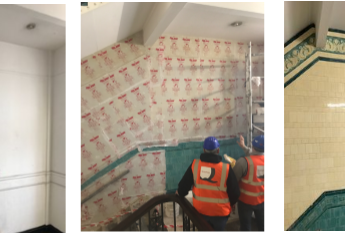 Works have included cleaning of fire damaged tiles, paint removal from glazed tiles and in-situ repairs and replacement to restore the tiles in the building back to their former glory. 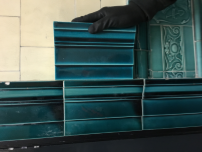 Bespoke handmade tube lined tiles have been created to match the originals. The tile design is first piped, giving the raised effect. Following this the tiles are then hand painted, glazed and matched as close as possible in colour to the original. 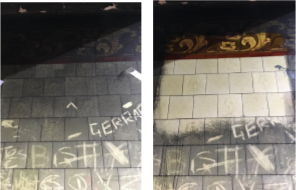 A paint peel away has been completed to expose the glazed tiles underneath. 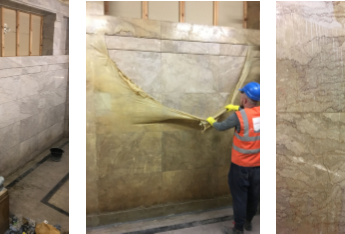 In addition to the peel away treatment used on the tiles, a Remmers Arte Mundit clean has also been undertaken on the marble. The dry cleansing paste removes pollution and dust without damaging the treated surface.